Where’s Chicken Little when you need him? Yea, I keep forgetting only a few listen to a conspiracy theorist; also, word is Homeland Security has Little on the no fly list. And most importantly what is falling from the heavens in my story are not acorns nor is the king ignorant of the ‘falling sky’ because in my story the royals are the conspirators. My current glass art series entitled Fire in the Madhouse, especially this title piece, may seem chaotic and may agitate or perturb. Fine, too many people don’t recognize or especially want to see the seemingly vast array of serious threats in our world. I’m looking up from parched California into our sky and there are long threads of what appear to be clouds; some think contrails from jets but that just ain’t so. I have no factual data, just 66 years of observations as a native northern Californian. For data look here:geoengineeringwatch.org This particular cloud formation is a man made nightmare; instead of fantastic cumulus cloud animals & wild cirrus horsetails parading across azure skies it has the look of a gigantic unravelling fabric with giant discordant threads. Oh, nice metaphor and is western civilization unravelling? People are zombies, heads bowed, praising almighty ‘Cellular’ contacts/content/friend me! Look up! A week ago while hiking I looked up to see a darkly painted jet aircraft ejecting it’s load into the blue sky as it headed from north to south and shortly after as I gazed skyward this same apparent craft was returning north with no contrails. Hm-m, what’s wrong with that picture. At the same moment farther to the west off the coast another sister jet aircraft was seen spewing it’s thread of noxious cloud materials. Never mind. If the moral of the Chicken Little fable is don’t believe everything you hear then fine. Never mind and forget me, artistic sublimations, etc., because I think I hear your phone a ringing ding dinging and it could be your new friend Foxy Coxy, Ducky Lucky, or oh my god Turkey Lurkey. 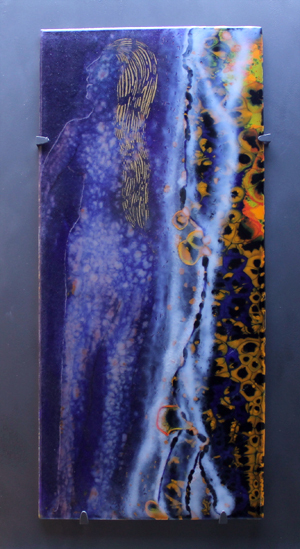 These past several days we’ve seen temperatures in the high 70’s & mid 80’s and it seemed appropriate to get into character for the final cold working of my fused art glass work entitled, “Fire in the Madhouse”. Also a big thank you to Auntie Stacey’s Face Painting. To understand my artistic interpretation and appearance Please click here, and have a nice day! 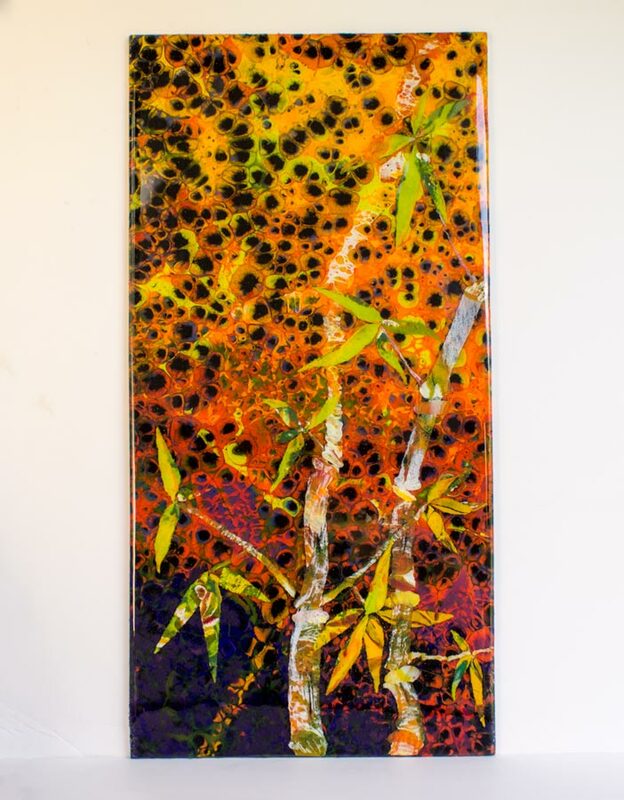 Stacey & I taught a fused glass class at the Lodge at Sonoma this past January. Normally my classes are in my Sebastopol studio, however, my new business card should read; Have Glass Will Travel. 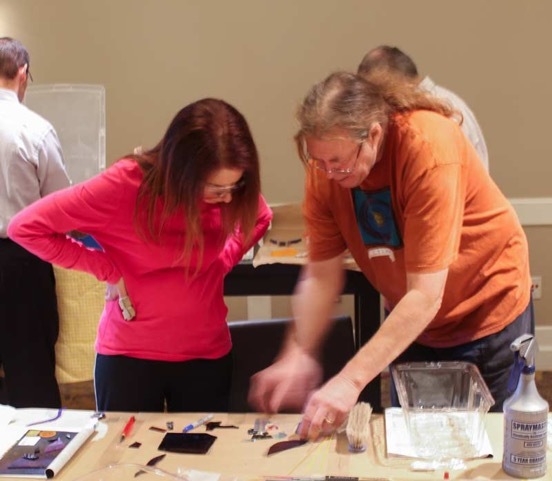 Participants made a tile, or pendants in just three hours. Super cool! 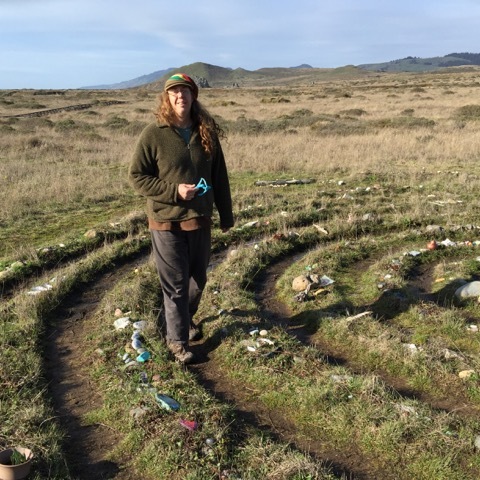 Drive 20 minutes due west from my glass studio and we arrive at the Shell Beach Labyrinth. The small blue glass casting in my hand is from a class some years ago, and she now resides on this pathway by the sea. A magical assemblage of sacred detritus, flotsam & totems. 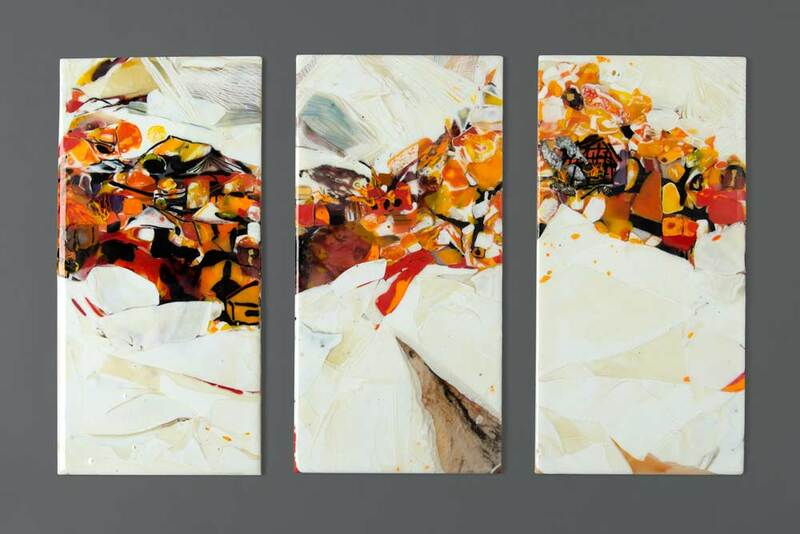 Glass has been part of my creative life for over 40 years and the seaside my home. My mother flew through the heavens above when I appeared by the bay waters. Castaway, flotsam & jetsam rescued, ferried, drifting, & sailing for decades too and fro upon the sea. A different path we all must tread, our unique dance, and at our particular pace. Some things take a lifetime or two. Me…I’m a late bloomer. So I walk the distance to find my center and a big part of the journey is through my creative glass art. 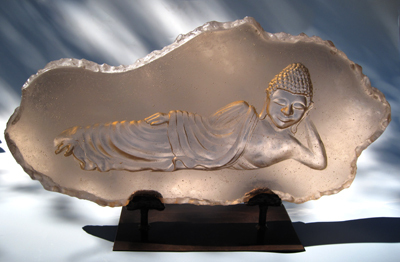 Glass casting begins with an original clay sculpture with as much detail as possible. A damn is made around the sculpture so that liquid latex can be poured into it, over the clay, to create a negative mold. Plaster is poured into the resulting latex mold, creating a positive mold that can withstand the heat of the kiln. The plaster cast is carved to smooth out any bubbles or other inperfections and for any embellishments such as added texture. It’s then filled with sand, which is weighed to determine the exact amount of glass to exactly fill the mold. The plaster mold is placed in the kiln, and filled with chunks of glass, broken billets. 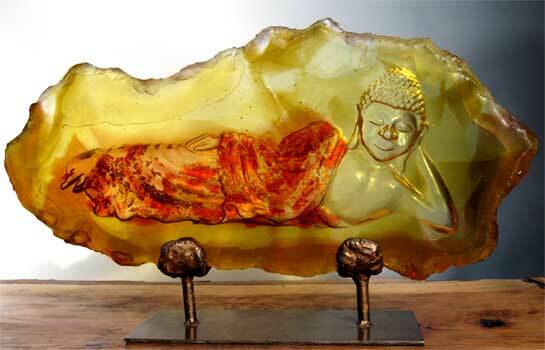 The “Reclining Buddha” required just under 20 pounds of glass. The kiln is heated to around 1500 degrees and annealed (cooled to room temperature) over a period of three days or more. Once the piece has reached room temperature the plaster is carefully broken off and discarded. The glass is then cleaned with dental tools, toothbrushes, and lots of elbow grease. The final step is polishing. The latex mold can be reused. 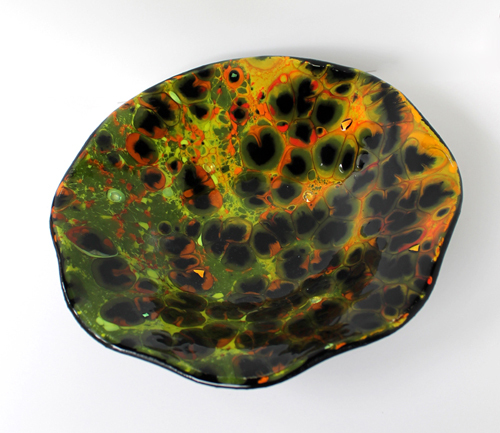 For info on fused glass, see my blog post. See a couple of my pieces on display at Coffee Catz, home of fabulous java and good vibes, in Gravenstein Station, downtown Sebastopol. Through December. “Bamboo Fantasy” and “Sunflowers” will be on display this weekend, Nov. 22 & 23rd in Occidental at the Joy Art Walk, in my wife Stacey’s area. She always shows pieces we collaborated on as well. See them the weekend afterward too, when Coffee Catz, local proveyor of culture and fine java, fills their cafe with work from three local artists. Occidental, CA 95465. See this blog post for photos and more info. This isn’t your ordinary county fair, Marin County’s 4th of July fair boosts the usual rides, 4H critters and fireworks, but it also hosts wonderful art. 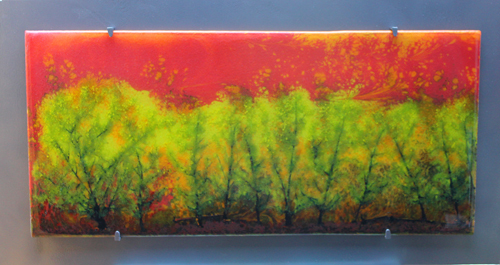 Leland’s fused glass painting “The Hot Wind” took second place in the glass category. “Bamboo Fantasy” each earned Honorable Mention. Congratulations Leland and thank you Marin fair. Ya sure, a few words loosed upon the summer zephyr that ghosts about the tree tops. I’m shifting my studio on the property, & puttering along with a trail through the woods to a small gallery for my future open studio shows and any scheduling for private appt. It would be swell if this was completed by fall; but events beyond my control can and probably will throw me off.